Preparing for hail: There are some normal maintenance activities that will also benefit your plants in the event of a hailstorm. The use of rowcovers may help to diffuse the impact of hailstones and reduce injury to plants, especially when using rowcover and hoops. When deciding how long to leave those covers on, or whether to put them on your later plantings, this is a factor to consider. However, we have also seen rowcovers completely removed by the high winds that can precede hail, so this is certainly not a fail-safe. The second precaution which will help in the event of hail is the application of a preventative fungicide such as copper or chlorothalonil. Although these products are not rain-fast, we have found that they still help reduce incidence of fungal and bacterial infections from hailstorms. After hail: The damage left by hail varies tremendously based on the size and shape of the hailstone, the wind velocity of the storm, and the duration of the hail event. Deciding how to respond is really case-by-case. Two farms right next to each other can experience very different levels of damage. However, there are some rules of thumb that generally hold true. 1)	Cucurbits are going to look really bad but are likely to recover. Those huge leaves tend to tatter very dramatically during hail, and can look absolutely awful. However, the leaves can also help to protect the growing points, which largely determine whether a plant will recover or not. Generally cucurbits that are old enough to have an established root system and have intact growing points will be able to generate new leaves very quickly and will begin producing fruit within a couple of weeks. To facilitate this process, give some extra nitrogen through the drip system. Pick and remove summer squash fruit that were damaged by hail if you can. 2)	All plants will benefit from a protective fungicide application. After hail, plants have hundreds of small (or large) wounds which leave them extremely vulnerable to diseases. As soon as you can get on the field, apply a protectant such as copper or chlorothalonil (copper will protect from bacterial and fungal diseases so is the better option), even if you applied one before the storm. This will help prevent infection while the plant heals up those wounds. 3)	Incidence of bacterial rot in onions is going to increase. We tend to see many more issues with onion storage following hail. Copper may help somewhat, but results have been mixed to poor. Deciding what to do with tomatoes can be tricky. According to Dr. Reiners, determinate varieties suffering from moderate to severe damage (think of snapped branches and stripped leaves-Image 1) are most likely to be lost causes because by the time they recover they will practically be at the end of their lives. It is best to pull plants at this threshold out. 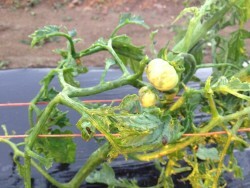 Indeterminate tomatoes have a better chance of recovering from hail. All fruit which was hit will be relegated to seconds at the very best. Damage can vary greatly by variety because of the differences in canopy cover, so assess each separately. Last year we saw Primo Reds that were a complete loss next to Amish Paste tomatoes which were about 80% ok.
On plants with heavy foliage such as corn and sweet potatoes, a foliar feeding including nitrogen and some micronutrients may be beneficial. Remember that you have to have intact foliage to spray for this to be effective. Once you have done everything you can to clean up and protect your plants, it is often best from a mental health standpoint to walk away for a few days up to a week. There is a small period of time where this is nothing more to do but let the plants recover. Nice time for a mini vacation. Really. As always, if you would like help deciding what to do after hail or any other weather event, please give us a call.